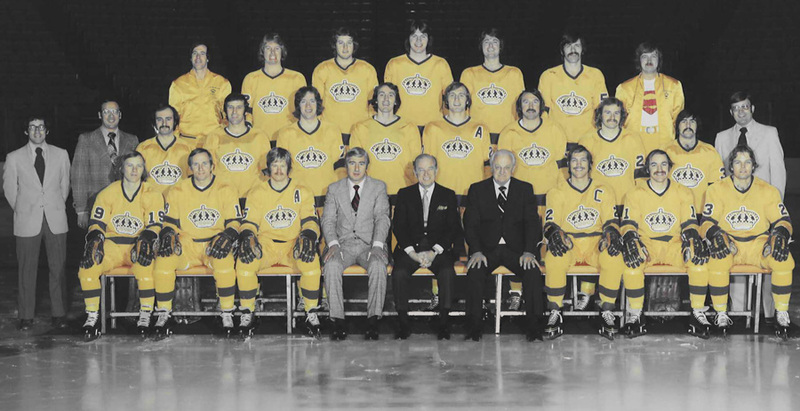 The 7th-seeded ’74-’75 Kings got off to a hot start offensively potting eight goals in both Game 1 and Game 2. In those games, the ’74-’75 Kings took up all six of the “stars,” but no player appeared more than once. Bob Berry led them with four points in Game 1 and then Dan Maloney led them with five points in Game 2. Then, in Game 3, the 3rd-seeded ’92-’93 Kings scored first courtesy of Jari Kurri, but the ’74-’75 Kings scored the next four goals to win 4-1. Tom Williams accounted for two of those goals. Then, on the back of two goals each from Juha Widing and Butch Goring led the ’74-’75 Kings to a 7-3 win in Game 4. They complete the sweep and now hold a 8-1 record in this tournament. They have defeated a Stanley Cup winner and a Stanley Cup runner up in their first two rounds. This sets up a 2015 Los Angeles Kings Qualifying Final between the 5th-seeded ’00-’01 Kings and the 7th-seeded ’74-’75 Kings! This entry was posted in Qualifying Tournament, Ultimate NHL Playoff and tagged Bob Berry, Bob Nevin, Butch Goring, Dan Maloney, Frank St. Marseille, Jari Kurri, Juha Widing, Kelly Hrudey, Los Angeles Kings, Qualifying Tournament, Tom Williams, Ultimate NHL Playoff. Bookmark the permalink.